Twelve Men's Morris, also known as Morabaraba, is closely related to Three Men's Morris, Six Men's Morris, and Nine Men's Morris. It is an abstract strategy game that dates back to before 1400 BC. A game board and 12 pieces for each player (checkers or coins work well for the playing pieces). The goal is to get your opponent down to two pieces or to block him from making any legal moves. The board is made up of three concentric squares, with three points marked on each side of each square (the two corners and a midpoint). 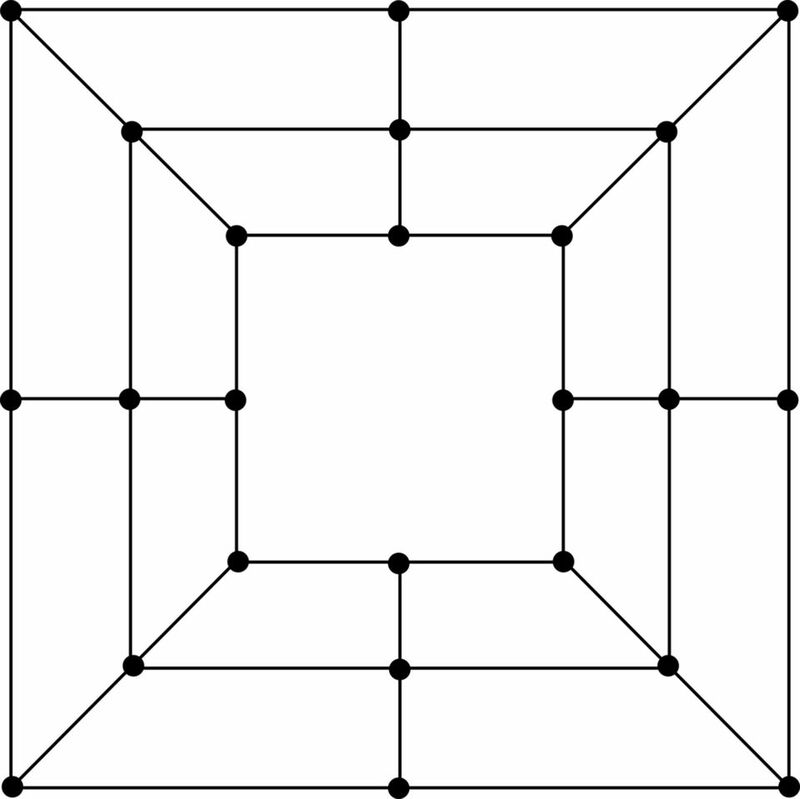 The same-side midpoints of all three squares are connected by a straight line. A total of 24 points are marked on the board. Here is a Twelve Men's Morris board (PDF). Setup Phase: Players taking turns laying their pieces on vacant points. NOTE: It is possible that the board will be completely filled at the end of the setup phase. If this happens, the game is a draw. Regular Phase: After all 24 pieces have been laid down, the regular phase begins. In this phase, a turn consists of sliding a piece along a line to a vacant point. The first player to get his opponent down to two pieces, or to block his opponent from making any legal moves, is the winner.